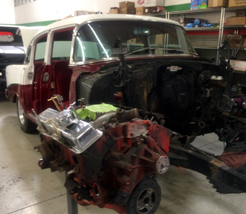 At Vintage Iron and Restoration we can help you restore, repair or update items on Muscle cars, Antique Cars, Vintage Cars, Classic Cars, Hot Rods and Roadster Era's. As you plan your needs, you may want to consider a few things that will have an effect on your project's budget. First you must decide on the car you like. Then what the cost will be and what it might be worth when it is done. If the car has some kind of sentimental value then it may not matter. So, with that said lets go through some of the steps that are taken in a restoration project. We will assume that you have some understanding of autos and also would like to participate a bit in the actual restoration of the vehicle. But do not worry, if you would like us to find, fully restore and deliver a beautiful finished project to your door that is not a problem, just let us know. So to continue for the hands on buyer or involved owner, you can search through classifieds, magazines, local junk yards and the internet to find the vehicle of your choice. And you will have a full array of choices from the rusted old bucket for "haul it away", to the auto which has been stored inside or under a cover which appears to be in fair condition. Have you driven the vehicle lately? Is there any rust on the body? Is there any rust on the frame? Are there any spare parts that come with the vehicle? 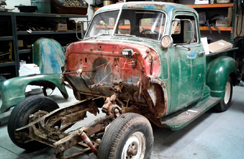 Sometimes folks collected parts to do a restoration or make a repair that they never finished. And it can ALWAYS be helpful to get the VIN # of the vehicle so you can run this and find out about the vehicle. Do a little research so when you go to view the vehicle you are already familiar with some of the past problems from sites like carfax, the manufactures sites, and various clubs have chat rooms telling of common problems the vehicle may have had. Also, check out the ID numbers of the vehicle in various places to confirm all the numbers haven't been removed. It maybe an indication of registration problems, just beware. Remember that the next move is for you or someone you hired to go look at the vehicle and make a final judgment before purchasing. Also the time to view the vehicle is on a clear dry day so you can see as many imperfections as possible. Remember poor light and a little moisture can hide some flaws to the inexperienced eye. This is the time that you need to check the body, frame, doors, tires, and suspension areas for misalignment, replaced parts, welded parts, bends or creases in parts. These all tell a story of some prior problem you will have to address to bring the vehicle to mint condition. These are also financial areas that can dig into your budget so look for these and evaluate them. Take pictures if you need to ask somebody for an opinion. Remember bodywork is usually the worst enemy for you to replace. Next, if you are fortunate enough to have a vehicle that actually starts, try to view it starting when it is in a "cold condition". If it is already warm sometimes a hard start is being covered up. Remember basically at this point you are evaluating the engine. Does it pour and continue pouring blue smoke out when started; this means it is an oil burner. And an old worn out engine usually. If the blue smoke clears shortly after starting, it may just mean a sticky valve or two and oil seeps/settles into the combustion chamber overnight. Clouds of steam upon startup could mean a blown head gasket or even a cracked cylinder head. Look at the coolant; this usually helps confirm some cross contamination by viewing a gooey mayonnaise like substance. Black smoke, this is usually caused by an over rich mixture of fuel/air. This can be a simple carburetor setting or if the carburetor is old and shot, rebuilding or replacing. A persistent light tapping near the top of an overhead cam engine could indicate a worn camshaft. A large knock on the bottom could be a big bearing and be fairly expensive to fix. 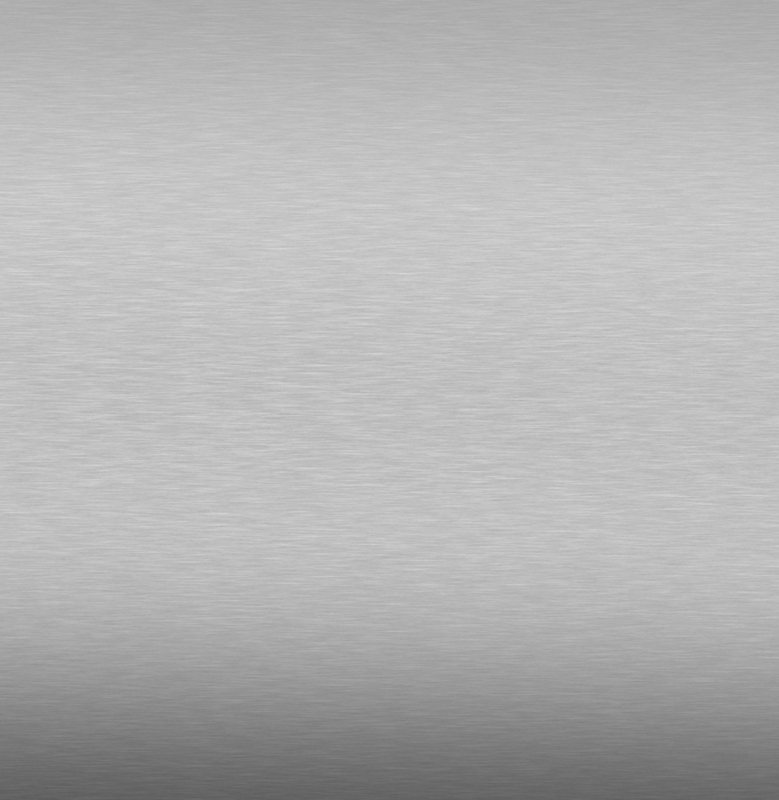 A rumbling noise could indicate a crankshaft bearing going out and again is fairly pricey to fix. Look at the all the fluids for signs of cross contamination or poor maintenance issues. Do they all look and smell as they should? If again your luck is really running in your favor maybe you can even take the vehicle for a spin. Now you can see how well it shifts, does the clutch engage properly or slip. Does the vehicle pull severely to one side? Does it pull to one side when the brakes are applied? How loose is the steering? Any clunks of any kind being some pricey repairs possible. So with all these points considered, you should be able to get your project off to a great start. It is always good to bring along a colleague or friend to check out the vehicles also. A couple more thoughts: remember originality can be very important when you are restoring this car. The main reason for this is you may someday sell this automobile and "originality sells". Say the cars you have been scouting are 20-40 years old, the chance of it being original are very slim. Service items such as batteries, brakes, tires, clutches, are all items that wear out and people expect these to be replaced. However, the seats, dash, headliner, door panels and trunk liner as examples, people like to see original materials. 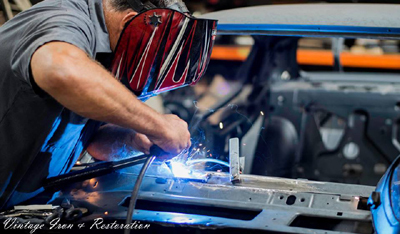 Also, when modifying the vehicle your insurance premiums can be affected depending on your type of restoration. As you plan your project, we would recommend stopping by the shop, with your vehicle (if possible) and spend some time discussing your desires. What type of restoration are you looking for? What are your plans for the vehicle? Are you showing, or a daily driver? Cruzing or wanting a total original condition vehicle? These are questions that will help determine the type of restoration you are looking for and we are here to help you meet those goals. 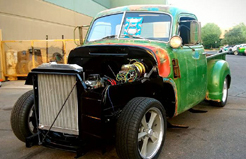 Frame off; This would include removing the body and all components from the frame, having the frame re-finished, rebuilding and/or replacing drive train, suspension, brake & exhaust components, rebuilding the engine (and transmission if necessary), and of course body & body component repair/replace & paint work. This could also include floor boards & trunk floor pans, fire walls etc. 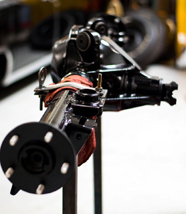 Component restoration; such as suspension, drive train, braking system, exhaust, etc. Removing the necessary components. Condition of the vehicle will play an important part of an estimate, If there is rust and/or corrosion, additional time must be considered for removing such components. Repairing and/or replacing components. In some cases components can be reused with minor repair or simple cleanup; sand or bead blast and paint or powder coating. We can help you with those decisions. Hopefully this information will be helpful when considering a Restoration Project. Again, the best way to get an idea of the investment involved is to stop by the shop to discuss your project. Examples of Restorations we have done can be seen on our Photos page by clicking on one of the large pictures at the top of the page. Enjoy !! We are located in beautiful Scottsdale, Arizona! We can arrange transportation of your vehicle nationwide.